(Nanowerk News) Balaji Sitharaman, Ph.D., Assistant Professor of Biomedical Engineering at Stony Brook University, is a 2010 recipient of the National Institutes of Health (NIH) Director's New Innovator Award. Only a select group of early-career biomedical researchers nationwide receive this award, which includes a 5-year $1.5 million grant. Dr. Sitharaman is engineering a nanotechnology-based theranostic (integrating therapeutic and diagnostic) technology for combined non-invasive imaging and targeted treatment of bone loss, a major health problem worldwide due to trauma, disease, and aging, including menopause. The NIH Director's New Innovative Award was created as part of the NIH's commitment to increasing opportunities for new scientists who are exceptionally creative and propose highly innovative research projects. The NIH touts these investigators as having bold ideas that have the potential to catapult fields forward and speed the translation of research into improved health. Dr. Balaji Sitharaman, Assistant Professor of Biomedical Engineering at Stony Brook University, received the 2010 National Institutes of Health (NIH) Director's New Innovator Award. The $1.5 million NIH Grant will be used for laboratory research on the use of a nanotechnology-based method to diagnose and treat bone loss. "The NIH is pleased to be supporting early-stage investigators from across the country who are taking considered risks in a wide range of areas in order to accelerate research," says Francis S. Collins, M.D., Ph.D., Director of the NIH. "We look forward to the results of their work." "Securing the NIH grant is a terrific achievement for Dr. Sitharaman, and his work helps support critical research and technology development in the bioengineering of bone healing," says Clinton T. Rubin, Ph.D., Director of the Center for Biotechnology, Distinguished SUNY Professor, and Chair of the Department of Biomedical Engineering at SBU. "Receipt of this NIH award for Dr. Sitharaman's laboratory is a great reflection on the creativity and quality of our School of Medicine faculty, the Department of Biomedical Engineering, and collaborative medical research at the University," adds Kenneth Kaushansky, M.D., Senior Vice President, Health Sciences, and Dean, SBU School of Medicine. 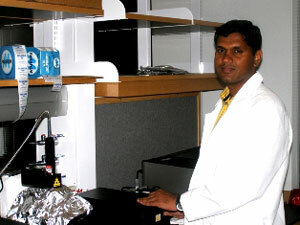 Dr. Sitharaman's proposed technology applies bone tissue engineering strategies and harnesses the physical properties of multifunctional nanonmaterials, which are single-walled carbon nanotubes and gold nanoparticles, and ultrasonic waves generated by a surface due to the absorption of pulsed laser light known as the photoacoustic (PA) effect. "This is an innovative approach of treatment involving biophysical stimulation to differentiate progenitor cells to become bone cells, thereby enhancing the quality and quantity of bone formation in an exposed area," explains Dr. Sitharaman. "We believe this work will provide new insights into the process of bone formation and how to treat bone loss, and lay the scientific foundation for future development of this theranostic technology." "Dr. Sitharaman's groundbreaking work in nano-medicine is a superb example of the integration of materials science and medicine," says Yacov Shamash, Ph.D., Vice President for Economic Development, and Dean of the College of Engineering and Applied Science at SBU. "The technology is a promising one in the frontiers of health care that could eventually help millions." Dr. Sitharaman envisions this technology upon complete development to be widely available in clinical settings. He contends it will be a safe, user-friendly technology, and suitable for patient populations in which standing is difficult, such as the frail, elderly, or those with spinal cord injuries. The Department of Biomedical Engineering at Stony Brook University is one of 25 departments within the School of Medicine and is part of the College of Engineering and Applied Sciences. Established in 2000, the department includes more than 60 faculty training students in undergraduate, MS and PhD programs. Areas of research emphasis include Biomechanics & Biomaterials, Bioelectricity & Bioimaging, Tissue Engineering, Bioinstrumentation and Biosignal Processing, and Cell & Molecular Bioengineering.